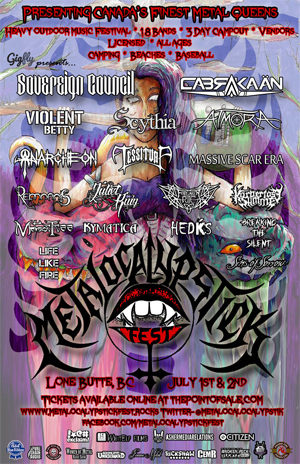 METALOCALYPSTICK FEST, the Western Canadian outdoor festival that just doesn’t celebrate heavy metal, but embraces the power of women in metal announce they will be moving venue locations due to scheduling conflicts with original venue in Valemount, BC. The new venue to host METALOCALYPSTICK FEST's 2017 line up for Canada Day weekend July 1st and 2nd will be the outdoor grounds of the Interlakes Community Center in Lone Butte, BC. "Unfortunately due to scheduling conflicts and a busy season with the grounds at Canoe River Campgrounds in Valemount, we decided they were unable to accommodate to host this year's Metalocalypstick. We have found a new venue in Lone Butte, BC at Interlakes Community Center." This year's line up features bands from across Canada and beyond with CABRAKAAN (Toluca, Mexico), SOVEREIGN COUNCIL (Kingston, ON), VIOLENT BETTY (Saskatoon, SK), ATMORA (Windsor, ON), SCYTHIA (Calgary, AB), MASSIVE SCAR ERA (Vancouver, BC/Cairo, Egypt) and many more!